This design service addresses the communication of complex discharge instructions to pediatric asthma patients and their families in the emergency room following an asthma attack. Asthma is a deadly condition-- disproportionately so in minority populations. The ER discharge experience and accompanying patient education tools are critical to the child's well-being. Existing discharge protocols rely on the verbal delivery of complex information and 5-15 pages of content written in medical terminology. Through extensive user research with five stakeholder groups, we arrived at our solution, which promotes a shift in communication model from a one-way from expert to lay person, to a shared exchange between the clinician and patient. Through the development of a new discharge tool for asthma education that organizes the conversation in simple actionable terms, we encourage a re-frame of the discharge experience as an active collaboration for more effective self-management beyond the ER. This work is part of the Coordinated Healthcare Interventions for Childhood Asthma Gaps in Outcomes, or CHICAGO Trial. This three-year study, funded by Patient Centered Outcomes Research Institute (PCORI), is a collaboration between 13 Chicago institutions including 6 hospitals and the IIT Institute of Design team of design students and faculty. The goal of the trial is to compare the effect of asthma interventions in the ER. The CHICAGO Trial study was launched March 1, 2015 and will compare three asthma interventions for their impact on healthcare outcomes; the project presented here is one of three interventions to be tested. Our team at the IIT Institute of Design conducted 38 user interviews with 28 participants over a period of seven months. We conducted three rounds of co-design with five different stakeholder groups: ER physicians, ER nurses, ER nurse administrators, primary care physicians and caregivers of children with asthma. We made observations at primary care clinics, asthma specialists' clinics and one medical call center and at all 6 participating ERs. During our interviews, we employed role-playing techniques to better understand both the patient journey and the clinicians' processes. 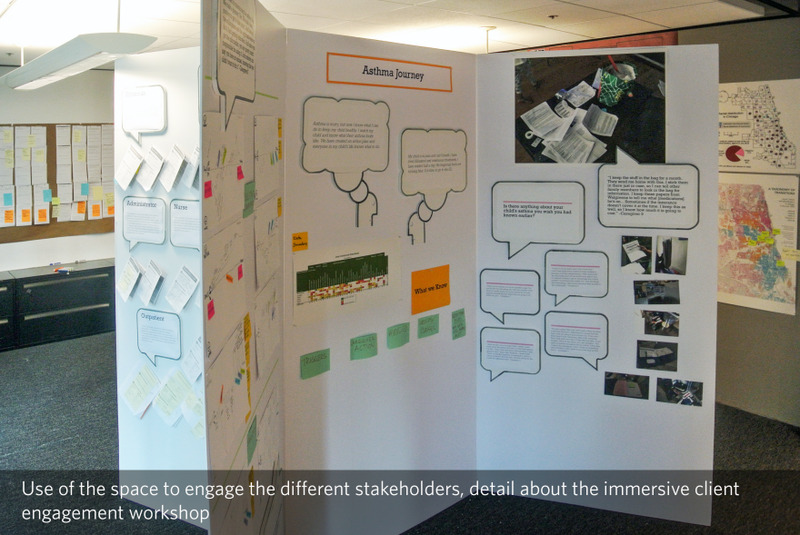 We conducted interviews in the homes of 9 caregivers of children with asthma using participatory activities to elicit more in-depth responses about their asthma journey, ER experience and environmental triggers. 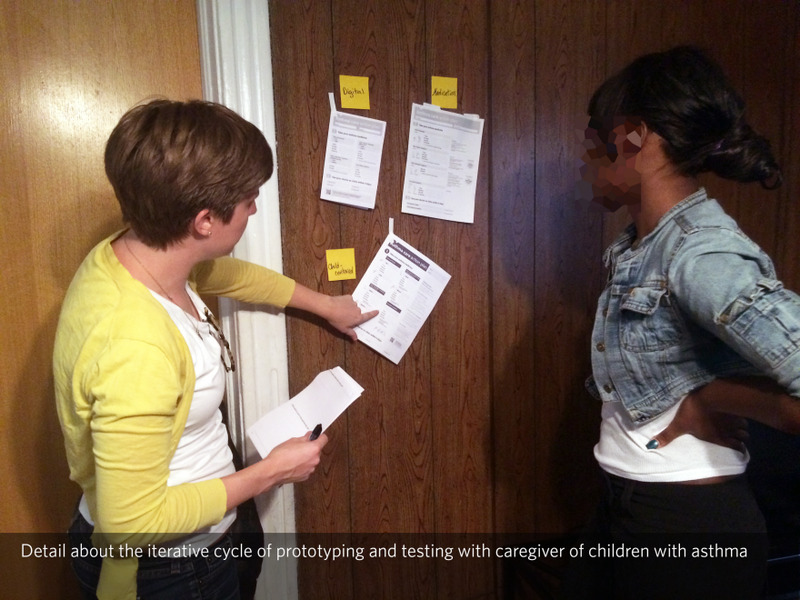 In addition to designing a new tool that reframes asthma education and patient discharge as a service, our team also worked to prove the value of design methods to the medical community. Many members of the CHICAGO Trial were unfamiliar with service design and its methods, which often seemed at odds with traditional medical research approaches. 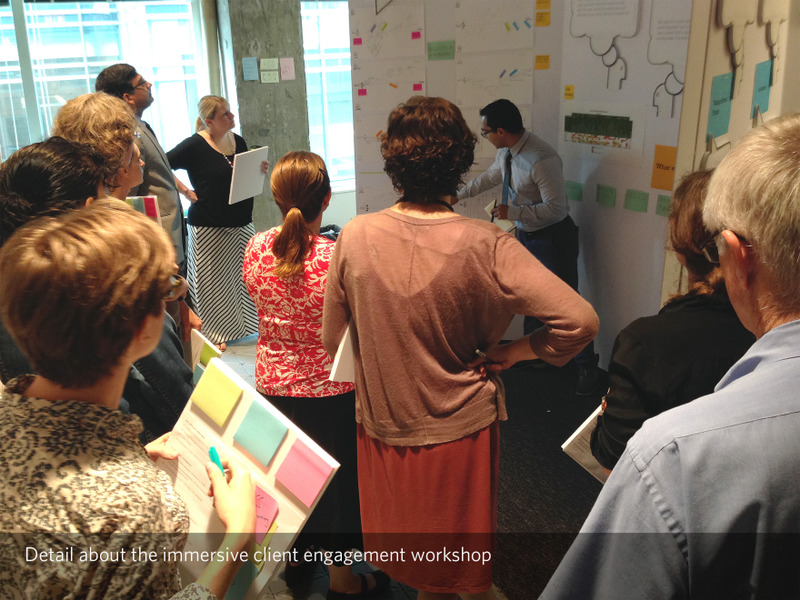 By including the Trial consortium in immersive client engagement workshops, we were able to leverage the Trial community's expertise and change their perspective on user-centered design for patient touch-points. The clinicians' exacting scientific method and evidence-based approaches brought meticulous rigor to the project, while the creative divergent thinking of design pushed the project into spaces not conceived of in the original research proposal. In the United States, asthma disproportionately affects young children in minority communities. African American children living in Chicago are 8 times more likely to die from an asthma attack than their white counterparts. In the predominantly hispanic Chicago neighborhood of Humboldt Park, 41 percent of children suffer from asthma. These populations have limited access to healthcare and often end up in the Emergency Room (ER) for asthma attacks. 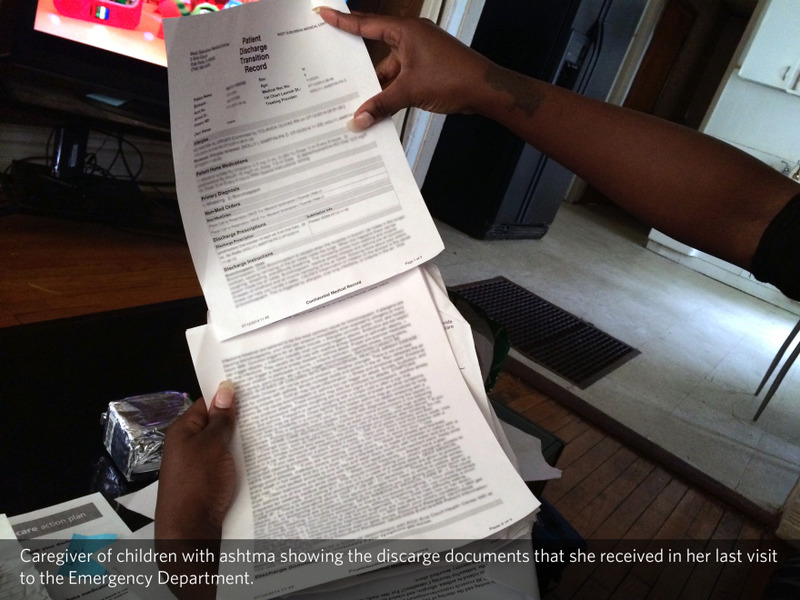 Research from Sinai Urban Health Institute suggests deficiencies with the discharge documents used with pediatric asthma patients and their caregivers. In addition to these deficiencies, there is also wide variation in discharge practices between institutions and even among practitioners at the same institution. When the caregivers of children with asthma lack the understanding and tools to implement the long term self-management needed for this chronic health condition, families get stuck in a cycle of returning to the ER. 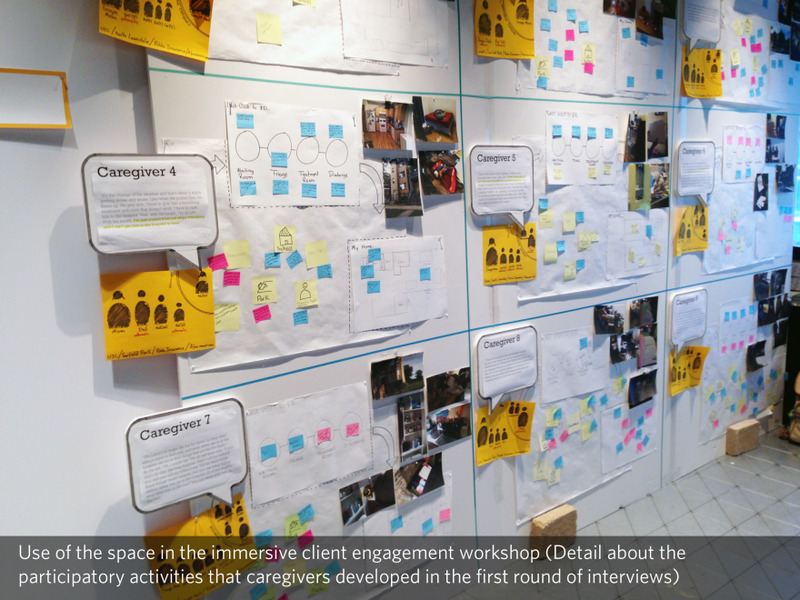 Examining the discharge process through a service lens enabled our team of design students and faculty to identify where patient education in the discharge process was failing to take root. This work is part of the Coordinated Healthcare Interventions for Childhood Asthma Gaps in Outcomes, or CHICAGO Trial. This three-year study, funded by the National Institute of Health (NIH) and the Patient Centered Outcomes Research Institute (PCORI), is a collaboration across six Chicago hospitals and the IIT Institute of Design to compare the effect of asthma interventions in the ER. The CHICAGO Trial consortium is a collaboration of nearly 50 members, including ER physicians, primary care physicians, asthma specialists, community health workers, City of Chicago health officials and the IIT Institute of Design team of design students and faculty. The CHICAGO Trial study was launched March 1, 2015 across all six participating ERs and will compare three asthma interventions for their impact on healthcare outcomes. The project presented here is one of three interventions to be tested. 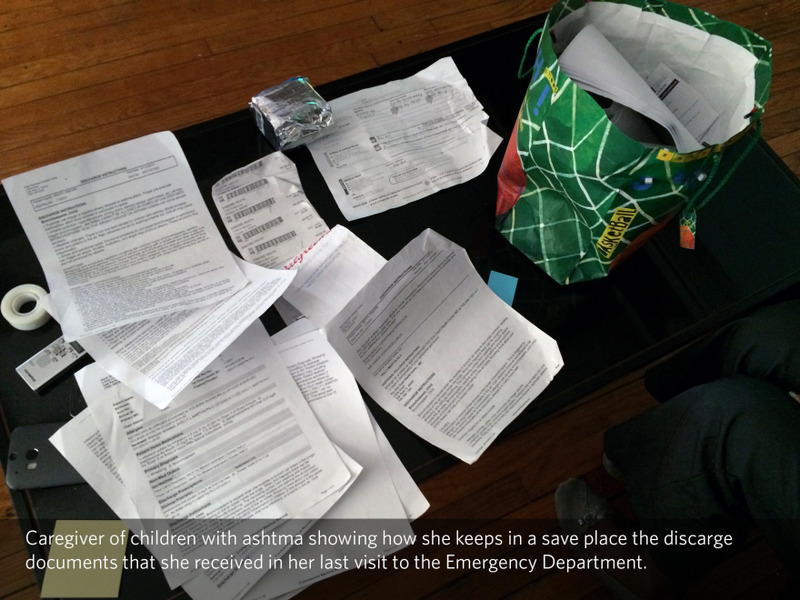 Originally, the goal of including a design team on the CHICAGO Trial was to amplify the voices of pediatric asthma patients' families and to redesign the ER asthma discharge materials. However, as we moved further into the project, two main insights emerged. Our first insight was that our design must go beyond reformatting existing educational materials by bringing a service-based approach to the discharge process. While evaluating the discharge experience through a service lens, we needed to address the underlying communication model used in the ER and understand the scope of the information in patient education. The existing communication model is a one-way transfer of complex instruction from the clinician to the pediatric patient caregiver -- orders for them to follow. However, caregivers need a conversational model to prepare them to build self-management skills and educate the extended community of people—schools, babysitters—who are essential in successfully managing their child's asthma. In response to our first insight, we strove to restructure the conversational model between caregivers and clinicians in a way that allows both parties to participate. We designed a tool that organizes the conversation around four main action items and uses plain language. Accessible visuals make for an easy diagnostic tool to use at home, enabling caregivers to educate their extended care communities. Room for caregivers—not just clinicians—to write, activates caregivers to think about the self-management process ahead. The new approach to patient education during discharge also extends to follow-up care. The redesigned tool provides a springboard for conversations with primary care physicians, making the most of short visits to plan for long-term care. 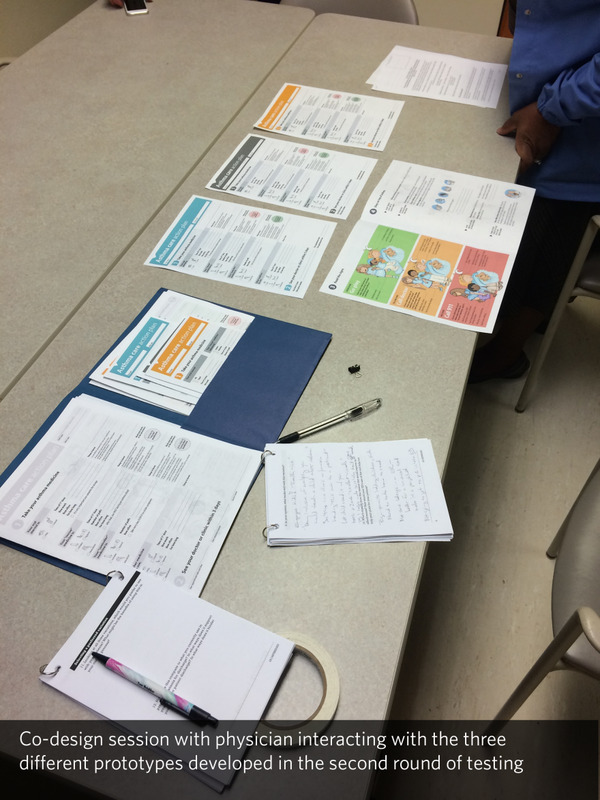 The experiential service lens accomplished two objectives: it highlighted the need for a communication model that is collaborative and shared, and it defined an experience model for discharge that must both inform the patient clinically and position them as proactive partners in the care of their child. Our second insight was that our redesign must take into account the needs of all of the stakeholder groups, not just those of caregivers. Working with the CHICAGO Trial medical researchers, we expanded our scope of work to include interviews with ER physicians, ER nurses and ER administrative nurses and primary care providers from six hospital systems, in addition to caregivers. The insights gained in these interviews played a pivotal role in defining our conception of the discharge experience. Our solution provides visual and physical cues to guide clinicians through the discharge process, while our layout prompts clinicians to pause and engage families with questions. This framing of the discharge process as an interaction, not only helps to standardize what is currently a varied practice, but also acts as a mediating object for clinicians to broach emotionally sensitive topics like cockroaches in the home - a known asthma trigger. Our team conducted 38 user interviews with 28 participants over a period of seven months. We conducted three rounds of co-design with five different stakeholder groups: ER physicians, ER nurses, ER nurse administrators, primary care physicians and caregivers of children with asthma. We made observations at primary care clinics, asthma specialists' clinics, a medical call-center and at all 6 participating ERs. 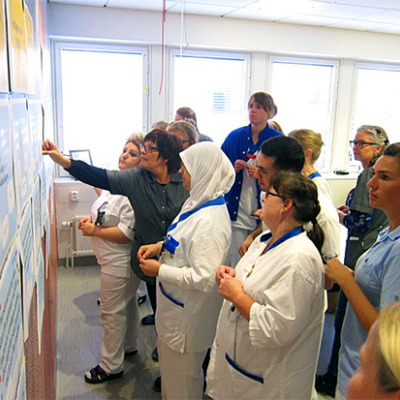 During our interviews with ER staff, we employed role-playing techniques to better understand both the patient journey and the clinicians' processes. Our interviews with ER administrators gave us insight into the organizational culture of the ERs and highlighted potential roadblocks in implementing a new approach. We conducted interviews in the homes of 9 caregivers of children with asthma using participatory activities to elicit more in-depth responses about their asthma journey, ER experience and environmental triggers. We mapped their living space and asked them to identify asthma triggers and safe zones. We asked families to illustrate the path their asthma journey has taken, and how their extended networks impact their child's life with asthma. A third activity encouraged families to share their experience in the ER and how the service they received compared to their expectations. 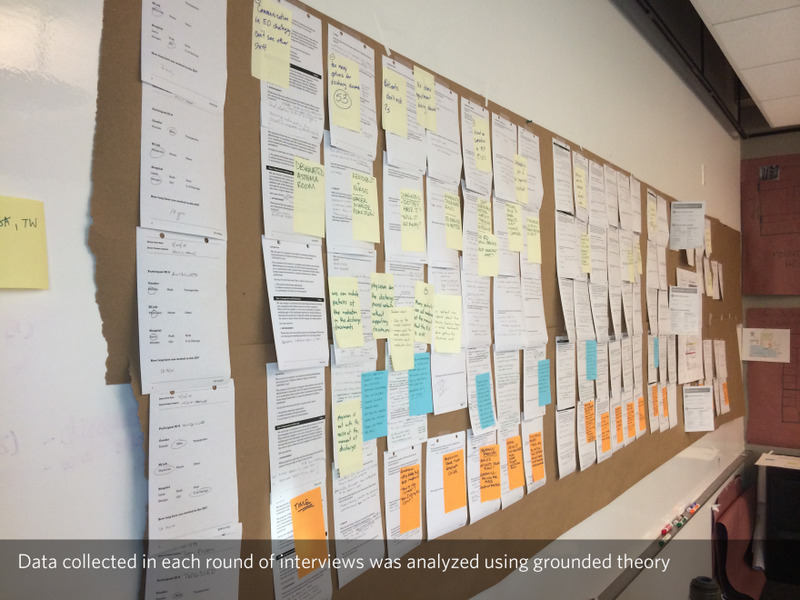 The data collected in each round of interviews was analyzed using grounded theory. Each researcher analyzed the data individually and then categories were discussed until an agreement was reached, generating clusters of information. In the first round of interviews, we showed all participants an early prototype of the educational tool for the discharge experience. For our initial interviews with primary care physicians, we used a co-creation method that allowed them to create their ideal discharge / educational tool for their patients to receive in the ER. We created a probe with printed content on post-it notes and encouraged the physicians to move, edit and contribute content. The resulting conversations were revealing and instructive at the detail level of language, priority of information and the importance of pre-empting common medication mistakes by caregivers. Using data from these interviews, we developed three concepts: a medication-focused concept, a visual concept aimed at children and low literacy populations, and a concept that included QR codes for easy access to digital resources. We took these three concepts back to the stakeholders and, using iterative cycles of prototyping and testing, we determined the most effective elements of each approach. We combined these into one tool. After one additional round of co-design interviews, we refined the tool to ensure we were meeting all stakeholder needs. There is a another story in this project, less directly related to rethinking the discharge service. In addition to defining a new service approach for asthma education and patient discharge, our team also worked to prove the value of design methods to the medical community. In the chaotic environment of the ER, it is easy to come up with ideas for improving the patient experience. However, in the high-stakes world of emergency medicine 'a good idea' is not enough. Knowing that every small change made in the ER may impact patients in life-threatening situations, ER staff need hard evidence. We learned first-hand the challenges of turning patient-centered ideas into medically valid solutions. 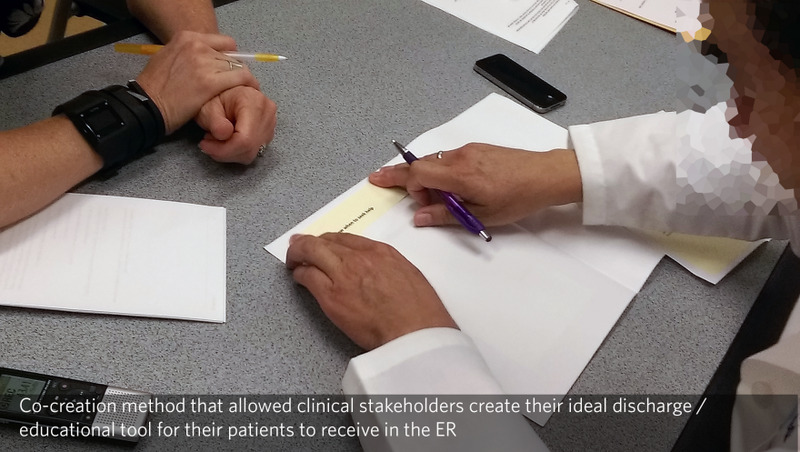 To meet this challenge we shifted from a patient centered view to a stakeholder-balanced view focusing all the stakeholders in the ER and how a service could support all of their needs. This approach was also reflected in our engagement with our clients, the CHICAGO Trial consortium. Many members of the CHICAGO Trial were unfamiliar with service design and its methods, which often seemed at odds with traditional medical research approaches. 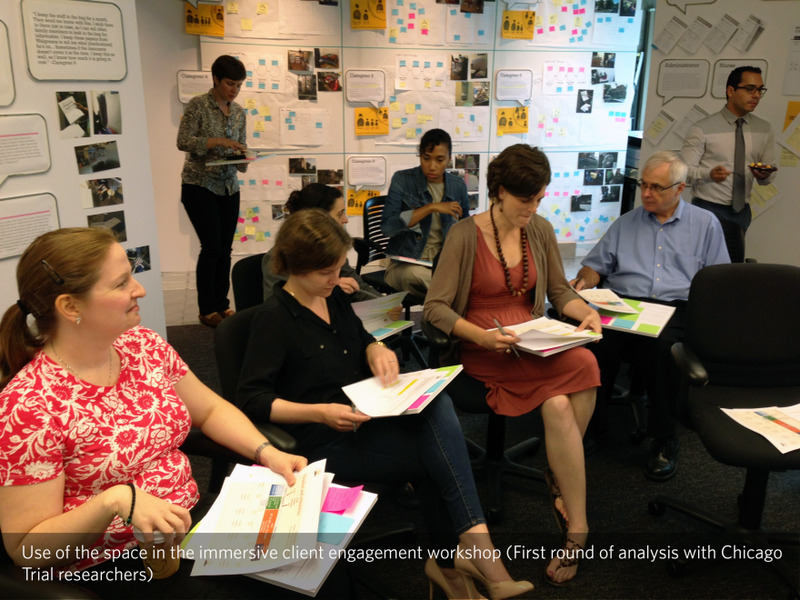 By including the Trial consortium in immersive client engagement workshops, we were able to leverage the Trial community's expertise and change their perspective on user-centered design. The clinicians' exacting scientific method and evidence-based approaches brought meticulous rigor to the project, while the creative divergent thinking of design pushed the project into spaces not conceived of in the original research proposal. It's a very well thought through look at the entire chain of people who affect pediatric asthma. The experience and the solution coming out of it can really inspire many other similar experiences...It was very gratifying to see such a high quality of work. This was very well thought through and it was great to see a real world application of a student project. There was a very beautiful collaboration between the medical staff and the service design student body to co-create solutions together. The proposal elegantly describes the balance that can be brought to a more scientific and evidence based approach to the approach that the students took.